K-State experts have provided insights into the winter survival of canola crops in regards to planting schedules and weather conditions. 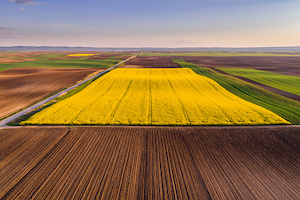 As the seasons change and winter inches closer, experts at the Kansas State University Research and Extension are considering what factors may influence canola, in particular. They note that there was a narrow window for planting winter canola in fall 2018, starting with September rains and ending with heavy rains in October. However, the September rains set the stage for favorable conditions for stand establishment. These factors may eventually come into play as the weather grows cooler. The experts say that canola overwinters in the rosette growth stage. For the greatest potential winter survival, a winter canola plant needs five to eight true leaves, six to 12 inches of fall growth, a root collar diameter of ¼ to ½ inch, and an extensive root system. In addition, hardened winter canola may be able to withstand temperatures below zero degrees Fahrenheit for short periods of time. Stem elongation may occur in the fall if the crop was planted too early, the crop was seeded at higher-than-optimal plant populations, or an unusually warm fall persists. Appropriate residue management can greatly benefit winter survival. Finally, there is still no telling whether fields with small canola will succumb to winterkill this season. The management of the crop, including the planting date, fertilization and seeding rate can all affect overwintering. November is typically when canola begins to acclimate to winter conditions. K-State agronomists are currently investigating production practices to help manage fall vigor and growth. They are also evaluating the effects of planting systems under different seeding rates to better understand the impact of various planting conditions.